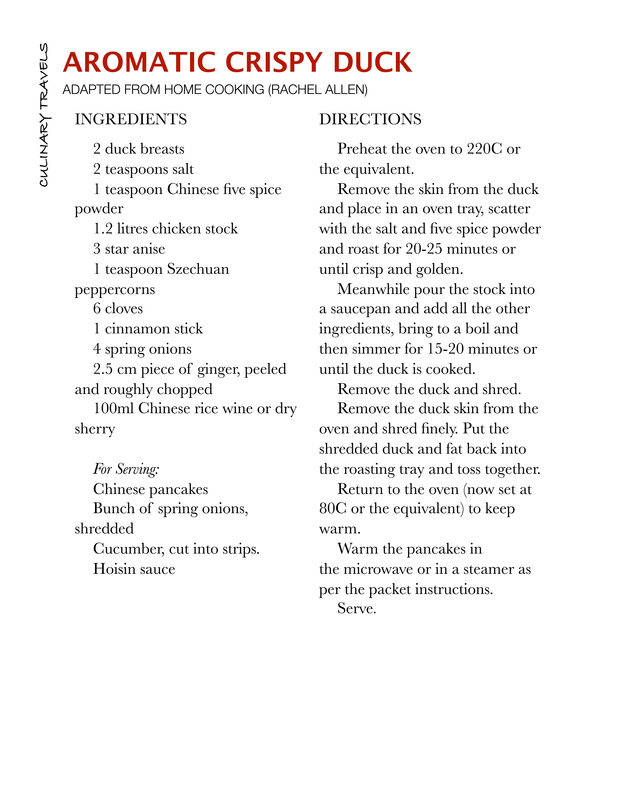 Peking Duck or Aromatic Crispy Duck is probably high up on most peoples favourite Chinese take out food. Something complicated and best left to the experts or so I thought until yesterday. Rachel Allen’s lovely new book Home Cooking arrived on my doorstep a few days ago and the Aromatic Crispy Duck Rolls were quickly bookmarked as a must try, a very quick must try. So quick in fact that I stepped out of my normal routine to cook them; when a new cookery book arrives I usually spend the time reading it through, listing recipes I want to try, recipes I need to adapt etc but not this time, as soon as I saw the recipe I began to plan making it, blow reading the rest of the book – that could wait. Rachel’s books are all delightful, lovely photography, lovely recipes but nothing overly taxing. These are not books to refer to if you want a ‘cheffy’ meal but if you’re after good honest home cooking they are a great source. I really enjoy Rachel’s writing style too, she doesn’t say much but what she does is well thought out, precise and to the point. On the other hand I can’t abide watching her on TV (I’m sorry), it’s the accent that does it; I love the Irish lilt, I could listen to it all day, but she somehow forces her accent, like an Irish, American, English hybrid and I’m sorry it grates on me; if she relaxed a little more in front of the camera I’m sure it would all come together so well as she has such flair. Back to the duck. Classic aromatic crispy duck and Peking duck are fabulous things, but unless you have hours (if not days) to spend preparing and cooking, not to mention the clean up time required, they are not very practical in the home kitchen. For a little more information on them look here. Rachel’s method could not be simpler, you simply poach duck breasts in a highly flavoured stock and roast the skins in five spice before shredding and combining. Not only does this make for a simple supper but it ensures the duck is moist and tender and the skin is crisp and crunchy, something difficult to achieve with the traditional methods used. I would always use home made stock here as the flavour is really important. It is obligatory of course to serve with shredded cucumber and spring onions, Chinese pancakes (which are easily bought in most food stores, although should you wish to make your own look here) and hoisin sauce. Hoisin sauce is a viscous, sweet, dipping sauce and its ingredients include water, sugar, soybeans, white distilled vinegar, rice, salt, wheat flour, garlic, and red chili peppers, and several preservatives and coloring agents. Despite hoisin actually translating into seafood it contains no seafood at all. Assembly is straightforward, take a pancake and spread with hoisin, place some cucumber, spring onion and duck down the centre and roll up, eat and enjoy. They make a great lunch or appetiser, even a dinner if you make enough of them and serve with a few other delights such as spring rolls and won-tons. Plenty of napkins essential and maybe finger bowls too if you’ve got guests, this can be one messy meal.